The first stage is a Linear DRIVE with up to +27dB of gain feeding the second stage; a stabilized “Germanium” preamp which overloads smoothly when overdriven. 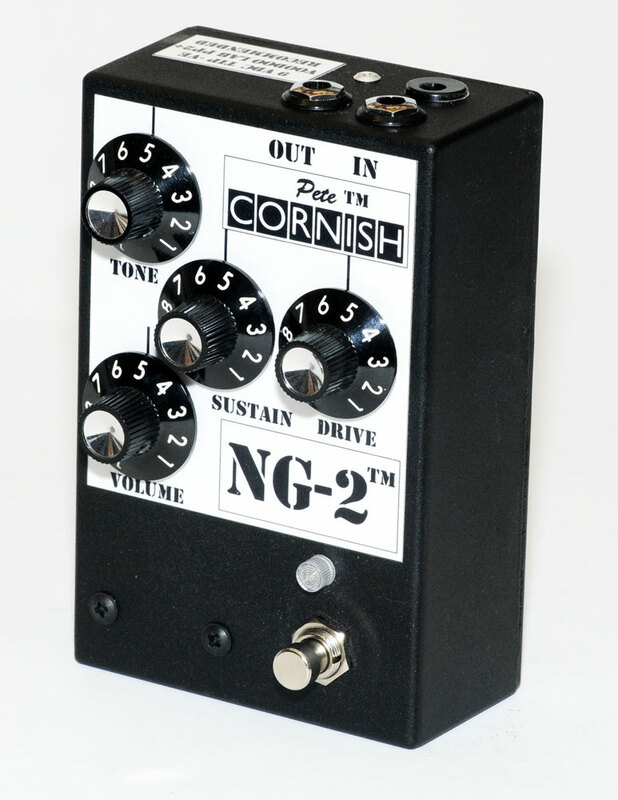 The third stage is where the NG-2™ magic takes place; it simulates a tube amp that has been underbiased or has suffered serious tube or output transformer failure (The sound just before the fuse blows). The SUSTAIN control adjusts the signal level into the third section and can be adjusted from ‘Tired Output Tubes’ to ‘Melted Tubes and Shorted Output Transformer’. High Impedence RFI rejecting input and bypass buffer. An input for a DC adaptor: the size of the coax connector is 5.5/2.1mm and the centre pin is negative. The voltage rating of the adaptor should be noise free at 9V DC and capable of supplying 20mA. We recommend the use of the Voodoo Lab Pedal Power 2 Plus adapter as meeting the above criteria and cannot accept any liability for damage caused to this unit by the use of, or to, any other type of AC/DC adapter. An adapter proving an output of an AC voltage should not be used as it will permanently damage the pedal: such damage is not covered under our warranty. If only a single unit is to be powered the BOSS PSA series may be more cost effective and is also recommended; but do not "Daisy Chain" other effects if using this adapter as this may cause hum problems. This unit has been built using the finest available components and constructed to the highest standards but should any fault occur during the two years from date of purchase please return it post paid to the above address where under guarantee repairs of any original manufacturing fault will be carried out (normal wear, misuse, unauthorized modifications or accidental damage excepted). The warranty will be voided if the guarantee labels are damaged or removed.